My question to the Lord when trying to write this post has been: how do I convey, what I am experiencing, even though I don’t truly understand it? Here is my best attempt. I pray it accomplishes what he intended it to accomplish. So, I’m in a bible study on prayer this semester at my church. And I’m reading a book on intercession. And although I am not lost, I am feeling somewhat over my head because it is beginning to challenge some of my internal (not spiritually based) beliefs. Beliefs such as: strong people pull themselves up by their own bootstraps, if I need help, I need to help myself, if I want something done right, I should do it myself. I’ve picked up some of that as truth, and I’ve incorrectly applied it to my spiritual beliefs regarding the church and my walk with God. I am finding these not to be completely accurate in the world of the church and God, and it is a very humbling, pride crushing, and completely wonderful experience all at the same time. I haven’t written on what I’ve been learning on prayer lately, because I keep waiting to get a grasp on it before I put it to words. That sounds dramatic. I still don’t have a good handle on the depths of prayer, but I feel like it might be quite awhile until I do, so I figured I’d share even if it’s just a little bit of truth. 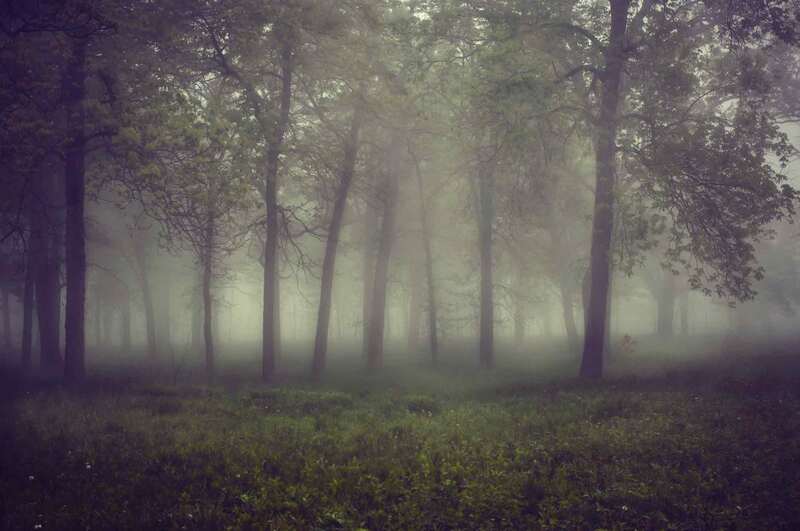 It’s almost like I’ve been sneaking morning walks into this misty wood, full of fog, yet beautiful and inviting. I can only see as far as my arm will reach, and it’s as though a comfortable cloud is continually wrapped around me, keeping me cozy and safe in my little space of discovery. I keep wanting to come back because it is so peaceful and captivating. It is quiet and I leave refreshed. The trees are inviting, and the further I walk into the wood, the more I see, each few steps brings me to a new revelation of beauty or depth and understanding. I am deeply fascinated by the branches and the bark, the leaves and new plants. However, the last few weeks feel a bit like the fog is starting to clear out a more, and instead of only seeing what is right in front of me, I’ve got a 15 to 20 foot scope all around me. And it’s kinda been a lot to take in. I’m not overwhelmed, but I’m just sorta staggered by how much there is, how beautiful, how deep, how connected but unique it all is. Please be sure to see my discovery through this lens, as this has been my general approach to my spiritual walk/life what-have you. Here is a girl about to be baptized, those of you church-folk know you’re suppos-to let the pastor/elder church guy actually baptize you, even Jesus didn’t baptize himself but asked John to do it. I’ma do it myself! I don’ need no- body’s help! And that has pretty much failed lately. I am learning that we NEED other people. And that God made it that way, on purpose. And it’s kinda messing with me and my idea of my independent self. A lot. A few weeks ago, the Lord gently suggested I ask to be prayed for at church regarding the migraines I’d been having. I didn’t. Then I regretted it. So, a week or two later at church, I felt like I should be obedient, and I inquired about where one would go if one wanted prayer. I was told that there was a prayer corner, where others in the church could pray with me after service, or I could put in a request to have some of the elders of the church pray for me. I went home and decided to think about it. I wanted to do the prayer corner thing, because it seemed less “bothersome” and attention drawing. BUT, I prayed about it and asked God what he recommended. While in prayer, I saw in my mind a picture of my friends husband (he’s an elder in our church, the only one I of know actually), praying for me, and putting oil on my forehead and me being healed. I took that as a go for the elder one, so I obediently put in a request to have prayer from the elders for the migraines. Even though it wasn’t my first choice. A few weeks later the Saturday night had come. Davin was going to go with me. The childcare was full before church even started and we arrived late to the service. We wandered the isles looking for seats, when my friend grabbed us and directed us to two seats next to her and her husband – I’m going to consider that as sovereign action number one because we normally sit in the same spot every service. I won’t list the other sovereign actions in numerical order, but it starts there. We also ended up sitting next to a mom and her son who was around 8 years old. During worship, he lifted up his hands just like his mama and a tear might have welled up in my eye. Towards the end of service, the pastor said somewhat uncharacteristically, “sometimes we need others to lay hands on us and pray for us.” My eyes got really big. He asked anyone who was experiencing pain from something in their life to stand up, so he and the church could pray for us. Which also doesn’t happen very often. I stood up so fast! Ain’t no shame in a cooperate prayer! That’s not a bother to anyone, they are going to do it anyway, why not get in on that? The young mom and her 8 year old boy along with my husband all put their hands on me. The pastor prayed for people who were having pain in their minds, among other things, but he prayed a great deal for our minds. I was like Whhaaaaaa? I asked the Lord how he could possibly orchestrate ALL this. Prayer in church the night I am at church to get prayed over?!? What confirmation! I thought to myself, God, you are so surprising, and crazy organized. The little 8 year old boys fidgety hand wiggled and tried to stay steady on my side. Tears welled up again in my eyes thinking that I could be so special that a precious 8 year old boy would pray for me. I was standing in God’s grace. Right in the middle of it. Doing nothing to deserve it, doing nothing to actually make any of it happen. Just standing there, receiving it, not pulling myself up by my own bootstraps. After service, we walked to the hallway and were greeted by four of our churches elders. My friend’s husband was totally one of them and I was relieved to see a familiar face. They were all so welcoming and friendly. I was nervous but Davin was there, so that made me feel better. I can’t tell you exactly what I expected when I thought of meeting the elders and having them pray over me, but it was completely different. First off, they were so humble. They didn’t act like they were boss over anything, or know-it-alls or authoritative. They reminded me of what maybe Jesus’ disciples might have been like, all different, but of the same heart. They acted like Jesus was there, and that he was in charge, not them. They didn’t act like they had the power to heal me, only that they had the authority to ask God to do something and intervene on my behalf. I sorta felt like I was back in bible times hanging around his disciples. I know, it’s probably over-imaginative, but that’s how I saw it. And, I was secretly glad to have imaginarily met four of his disciples. Then they asked me what was going on. I explained that since September (after the worship, prayer and healing night at my church), the migraines have been better but are not gone. I shared how a few weeks ago, the Lord led me to be prayed over at church and I didn’t listen. I explained I was there to be prayed for out of obedience. I explained a word picture the Lord gave me when I asked him why I had to pray for something more than once, how he showed me my hands, full of arrows, and a large haystack target in front of me. He told me that with this specific type of prayer or healing, it isn’t enough to just hit the bullseye once, but that the whole target had to be filled with arrows. It reminded me of the scripture where it says in Romans 8:26, “Likewise the Spirit helps us in our weakness. For we do not know what to pray for as we ought, but the Spirit himself intercedes for us with groanings too deep for words.” It was like the Lord was showing me there was a lot more to why I was allowed to experience migraines than just a simple one prayer answer. And although I don’t know or understand all that is behind it, he does. Each prayer that is prayed, he can interpret before God the Father on my behalf until I am healed. Having the elders pray for me was shooting more arrows at that target. Each elder prayed for me. The first one, the oldest, put some frankincense and myrrh on my forehead. It wasn’t ceremonial or serious, he was like “Ummmm, should I put some oil on her head? The other guys were like, “yeah, sure”, “yes, good idea!” He then read the label and said, “Ohhh, Frankincense and myrrh, this is the good stuff! I’m totally paraphrasing, but hopefully communicating the gist of it. We all laughed. Each elder prayed something different and specific over me. I remember the last one praying protection over me from the enemy. Because so much of this experience has felt like a spiritual attack. That was when I felt like the Lord showed me how he has given authority to men, in this case to the elders, to intercede and provide spiritual protection. I felt shielded. When my friends husband prayed over me, he said he saw that the the arrows were also about me teaching other people about prayer, that I would take other people’s arrows and shoot them at the target because they did not know how to aim. That these migraines are not just about me, but will be used to show other people about prayer. I started tearing up again because I could hardly believe the words he was saying. This guy doesn’t know me. He has no idea I’m reading a book on intercession (praying for others – shooting their arrows) and he doesn’t know I’m in a bible study on prayer right now, and that I’m writing all about it on the internet! Again God was showing me that he was bigger than me, and had orchestrated this whole night. He showed me that he is sovereign. When we finished praying, I felt so full of life. The last guy to pray over me said he felt like prayer and fasting was what the Lord put on his heart to share with me. I asked God about it later, and I really felt like God put it on my heart to fast this blog, facebook and instagram last week. I know that sounds like a lame fast, but it’s what I felt like he said. I wanted SO BAD to write all about this whole thing the minute I got home. But I’m glad I didn’t because more happened. That night, I started to feel a very, very slight pinch near my right eyebrow where I typically get a migraine. That’s all it was. I could almost see in my mind, Jesus holding it back, pushing it back and saying, I AM keeping this from you. I thanked him. The night prior, Davin and I went on a date, and it was the first date in I don’t remember, when I didn’t get a migraine. We even went go-cart racing. Not any pain at all. I felt like God was already honoring my obedience to be prayed over before it even happened. A few times this week, I’ve started to feel the very beginnings of a migraine. Instead of me just praying for it, I’ve right away told Davin, and he’s laid hands on me and prayed, and it’s disappeared. One night I even texted my mom and she prayed and it faded right away. This doesn’t just happen. This didn’t ever used to happen. It used to be that the pain would only get worse the longer I waited to take drugs. Until it was almost unbearable. It used to last thee days, with drugs. Every 6 hours the pain returning until I took more drugs. Then, the other day, we went out to celebrate my mom’s birthday. I had started to feel the beginnings of a migraine a bit earlier in the day. Davin prayed over me and it mostly (but not completely) went away. I thought about texting my parents, but I didn’t want to bother them. Then at the restaurant, it started to get worse very quickly, so much so that I was beginning to feel nauseous and couldn’t’ really concentrate. Not wanting to be a bother, I went to reach for my stash of pain reliever (which I haven’t taken since my last post on migraines) and my mom asked what was wrong. She said, let’s pray right now before I could even pull any out. She told my dad, and right there, in the middle of a bar during happy hour, my parents and husband prayed over me. It wasn’t loud or attention drawing, just a quiet prayer. I started to feel better, but when she asked a few minutes later how it was, I told her that it wasn’t completely gone. So they prayed again for me. And again, twenty minuets later. Then, my migraine was gone. The nausea was gone, the throbbing gone, the sharp grip on my skull was unexplainably gone. How can I explain all of this? If I weren’t the one experiencing it, I’m not sure I’d really believe it. I would want to rationalize it, saying things like, “oh, she must have stopped eating something that was causing it, or oh she took the proper mix of supplements and that aided it.” My mind would keep looking for a physical solution that occurred to explain it in my own reality. Because in my reality, if I have a problem, I must do something that costs me to fix it. I must try hard, or make it happen. I must do something. But I’m not the one doing anything. This experience is stumbling. All my realities and truths of how things work are stumbling all over it. Guys, God wants to heal us. From REALLY BIG stuff. From stuff that doctors say we can’t be healed from. From physical pain, from emotional pain. From our past. From the very things WE think we can never, ever, ever fix ourselves. Because we can’t. And he might not even use you to do it. I am learning that the reason he created the church, is so that we would be connected. I was never meant to be able to pray for myself all the time, to baptize myself or to teach myself about God’s word with just him and me by myself all the time. We were designed to be connected. This is a new concept to me. It probably shouldn’t be, because I thrive so much due to my very deep and wonderful friendships in Christ, but it is. Sometimes God wants to use others. Sometimes he wants us to feel the grace of being prayed over by a fidgety, adorable 8 year old boy. To have my mom stop in the middle of her birthday dinner and pray for me, four times. So that when I walked out of that restaurant, I walked home with a gift, and it wasn’t my special day. So, that’s all I have so far. I am learning tons in the books, but nothing teaches quite like real life experience, which is why I am probably still in shock, because it’s easy to read about something and think, “yeah, that’s how it should work, that sounds right.” It’s another thing entirely to live it out. To have pain gone, for no reason other than prayer, and to not be the one making it disappear. I haven’t bled my eyes out in prayer over this, I haven’t starved myself and fasted and tried really, really hard. All I’ve done is TRY to be obedient (which I wasn’t even that good at), and try to ask for prayer from others when I start to feel pain. That’s it. That my friends is a crazy, crazy, reality altering experience, and I still can’t fit it into my box of how things should work and be and go. It makes NO sense, not to this control loving girl. I’m sure I will write more as I learn. But until then I’ve figured out that God is sovereign and he intended for us to be connected and that I am not the boss of my world.